Rolwaling region trekking is non touristy trekking trail in Nepal . Rolwaling valley lies on the original expedition route to Mt. Everest and was only accessible to members of these expeditions. Now, people who would like to climb Parchermo peak (6187 m), one of the eighteen designated "Trekking Peaks" in the Himal are allowed to travel through this area. The trek through the Rolwaling Valley is truly one of the best wilderness off-the beaten-path travel experiences. The strain and degree of difficulty are constantly rewarded with visits to remote villages, the magnificence of the always-present mountains and walks through thick Rhododendron forests. 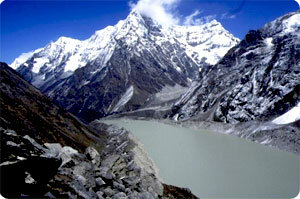 On the approach to the Tashi Lapcha pass , the northern skyline is constantly dominated by the summit of Mt. Gauri Shankar 7145m, which was confused with Everest for long time and thought to be the highest mountain in the world. Rolwaling trek takes you through a demographic cross section of Nepal that can not be sampled on any other trek. Since the reopening of rolwaling trekking route the small Sherpa villages of Beding and Na are accessible for trekkers to see the unique and traditional Sherpa culture, untouched by western influence. Since Rolwaling region trekking trail has been open Himalaya Journey Trekking and Expedition - Nepal operate huge number of trekkers in relevent areas.